The Farm Fresh Customer Satisfaction Survey, found at www.FarmFreshlistens.com, is an online survey designed by Farm Fresh that can help the company determine satisfaction ratings of its individual stores. This helps them understand what is working and what may need adjustments. This is an online survey, which gives you convenience as you can do it whenever you have time. Farm Fresh understands that you lead a busy life. They want to make it worthwhile for you to participate in the survey so they can get as much feedback as possible. Because of this, they offer a reward in the form of a weekly drawing. 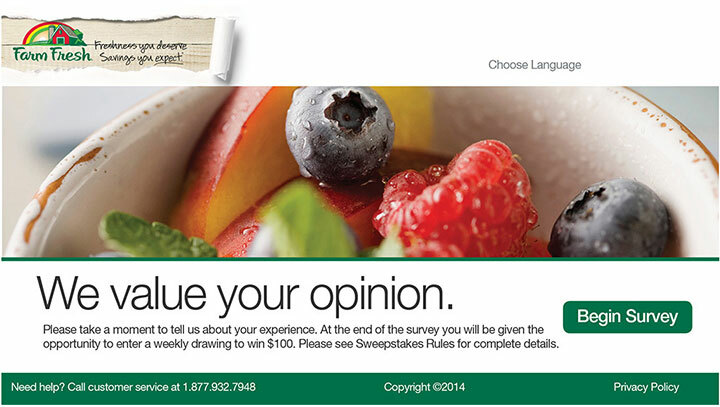 You have a chance to win a $100 Farm Fresh Gift Card by taking the survey and putting your name in the pot. Farm Fresh Food & Pharmacy is a chain of supermarkets. The company currently owns and operates 43 locations, with most located in the state of Virginia. Farm Fresh Food & Pharmacy’s headquarters are currently located in Virginia Beach, and the grocer’s largest presence lies in the surrounding Virginia Beach/Norfolk/Hampton Roads area. Farm Fresh Food & Pharmacy was founded back in 1957 by namesake David Furman. Additionally, the grocer’s name was chosen from entries submitted by local residents. In 1986 Farm Fresh merged with its competitor Giant Open Air Markets, acquiring 26 grocery stores and 43 convenience stores. In the late 90s Farm Fresh ran into financial problems, and filed for bankruptcy. About a year later Richfood Holdings, Inc., purchased Farm Fresh. In August 1999, Richfood was purchased by Minnesota headquarted SuperValu Inc.
Have your recent Farm Fresh receipt that contains an invitation for the survey. Click Begin Survey, or change the language to Spanish and click Begin Survey. Enter the text as it appears as an added security measure, then select Next. Type the code from your receipt into the box provided. If you have trouble locating the code, click the “See Example” hyperlink for a diagram. Select next after entering the code. Questions will be shown over multiple screens. It is important to answer them honestly and provide as much information as you can. When text boxes are present, consider using these to add information to give the company as much feedback as possible. When you have finished answering all the questions, you will have a chance to enter the weekly drawing. You are not obligated to enter in order to leave feedback. Follow directions for entering the drawing, or close the page if you prefer not to enter.